Low spreading evergreen bush with dull sage green fragrant leaves, pale grey underneath. 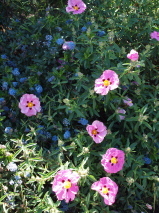 In spring and early summer clear silvery-pink crepe like flowers appear, with a central bunch of yellow stamens. 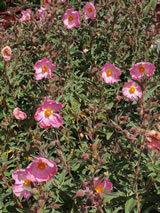 Grows best in full sun, with well drained soil, hardy. Trim after flowering to maintain shape. Frost hardy / Prefers a sunny site / Tolerates coastal sites / Tolerates exposed sites.